In cinemas this week: Guardians of the Galaxy, Begin Again, And So It Goes and Bethlehem (Nova). Guardians of the Galaxy - This action-packed, epic space adventure, expands the Marvel Cinematic Universe into the cosmos, where brash adventurer Peter Quill (Chris Pratt) finds himself the object of an unrelenting bounty hunt after stealing a mysterious orb coveted by Ronan, a powerful villain with ambitions that threaten the entire universe. To evade the ever-persistent Ronan, Quill is forced into an uneasy truce with a quartet of disparate misfits - Rocket (Bradley Cooper), a gun-toting raccoon, Groot (Vin Diesel), a tree-like humanoid, the deadly and enigmatic Gamora (Zoe Saldana) and the revenge-driven Drax the Destroyer (Dave Bautista). But when Quill discovers the true power of the orb and the menace it poses to the cosmos, he must do his best to rally his ragtag rivals for a desperate stand, with the galaxy's fate in the balance. Begin Again - The latest film from writer-director John Carney (Once), Begin Again is a soul-stirring comedy about what happens when lost souls meet and make beautiful music together. Gretta (Keira Knightley) and her long-time boyfriend Dave (Adam Levine) are college sweethearts and songwriting partners who decamp for New York when he lands a deal with a major label. But the trappings of his new-found fame soon tempt Dave to stray, and a reeling, lovelorn Gretta is left on her own. Her world takes a turn for the better when Dan (Mark Ruffalo), a disgraced record-label exec, stumbles upon her performing on an East Village stage and is immediately captivated by her raw talent. From this chance encounter emerges an enchanting portrait of a mutually transformative collaboration, set to the soundtrack of a summer in New York City. Review to come to GWP soon (★★★★). And So It Goes - There are a million reasons not to like realtor Oren Little (Michael Douglas), and that's just the way he likes it. Willfully obnoxious to anyone who might cross his path, he wants nothing more than to sell one last house and retire in peace and quiet -- until his estranged son suddenly drops off a granddaughter (Sterling Jerins) he never knew existed and turns his life upside-down. Clueless about how to care for a sweet, abandoned nine-year-old, he pawns her off on his determined and lovable neighbor Leah (Diane Keaton) and tries to resume his life uninterrupted. But little by little, Oren stubbornly learns to open his heart - to his family, to Leah, and to life itself. Bethlehem tells the story of the complex relationship between an Israeli Secret Service officer and his teenage Palestinian informant. Shuttling back and forth between conflicting points of view, the film is a raw portrayal of characters torn apart by competing loyalties and impossible moral dilemmas, giving an unparalleled glimpse into the dark and fascinating world of human intelligence. Weekly Recommendation: A thin week of releases, but a strong one. 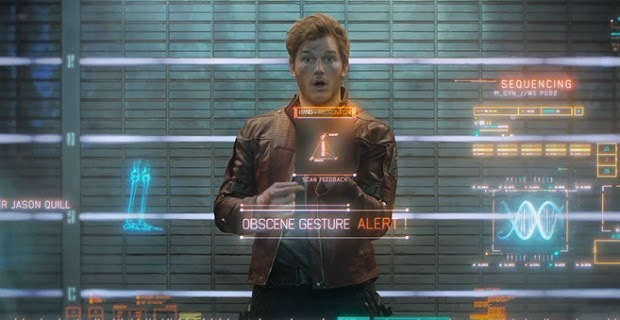 Guardians of the Galaxy is as entertaining as the Marvel Cinematic Universe has ever been. For the most part, it buckles the formula, combining exciting intergalactic action sequences with sharp (and frequent) humour. Plus, the cast is a riot. Begin Again is a pleasant and exceedingly watchable rom-com about how music can bring people together and inspire. Ruffalo and Knightley are terrific together. Bethlehem screened at last year's Jewish Film Festival. The complex, fraying relationships at the core of this thriller, and the authentic insider look at both the agendas of the militant revolutionaries and the procedures of the Israeli secret service, make for grim but powerful viewing. I actually preferred it to the similarly-themed Oscar-nominated Omar. I have yet to hear one positive comment about And So It Goes, despite the Douglas/Keaton pairing, so I am not going to rush out and see that.